Quicken displays the dialog box used to enter investment transactions. Select Buy – Shares Bought in the Enter Transaction drop-down list box. 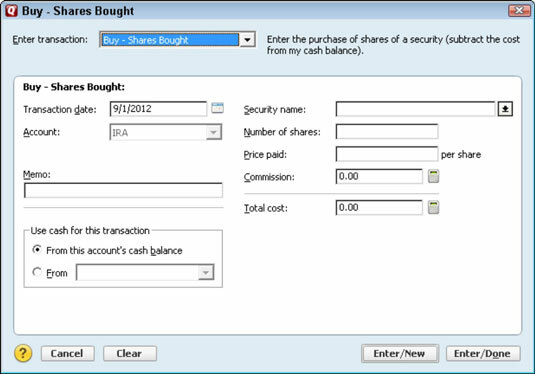 Quicken displays the Buy – Shares Bought version of the investment transaction entry dialog box. Enter the purchase date in the Transaction Date text box. (Optional) Enter a description in the Memo text box. Enter the bank account on which you’ll write the check that pays for the shares. Select the account name in the From drop-down list box. Indicate the size of your purchase by using the Number Of Shares and the Price Paid text boxes. Tell Quicken the size of your investment by giving the number of shares purchased and the price paid per share. Enter the commission or fee that you paid. Click the Enter/New button if you want to record the transaction and enter another new transaction, or click the Enter/Done button if you want to record just the single transaction. Quicken records your purchase of new shares. You are now a capitalist. Congratulations.